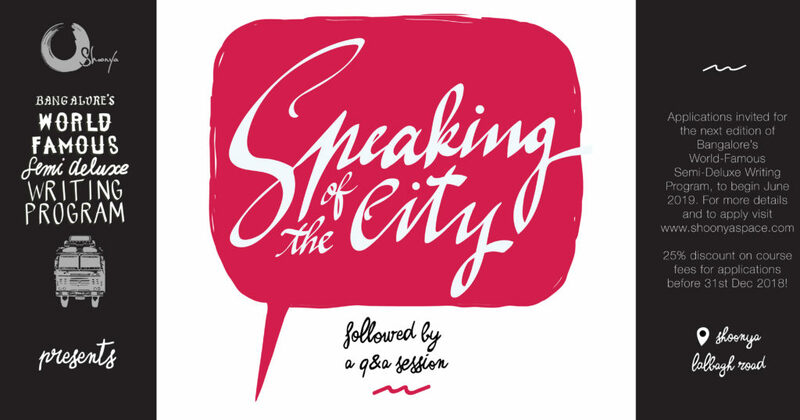 Bangalore’s World-Famous Semi-Deluxe Writing Program sponsors a monthly curated talk called Speaking of the City, right here at Shoonya. 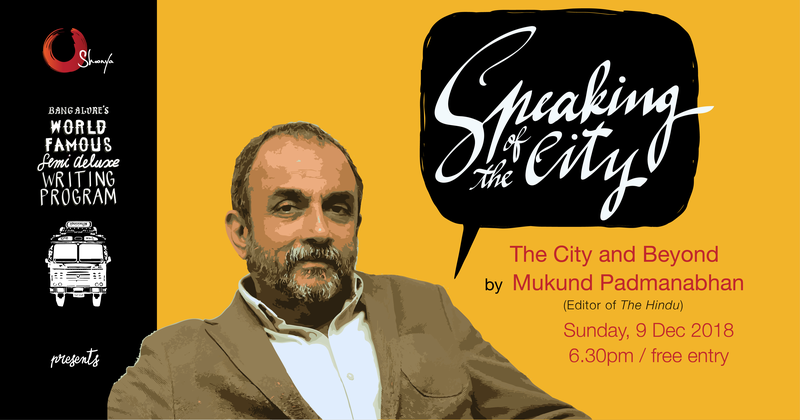 Writers, artists, journalists, scholars, architects, scientists, entrepreneurs, historians, geographers, activists or anyone who has worked on Bangalore will be invited to speak of this city that we all inhabit. The first talk in our lecture series, in July 2017, was with Ramachandra Guha, and was followed by a session with Vivek Shanbhag, both of which pulled in big crowds. 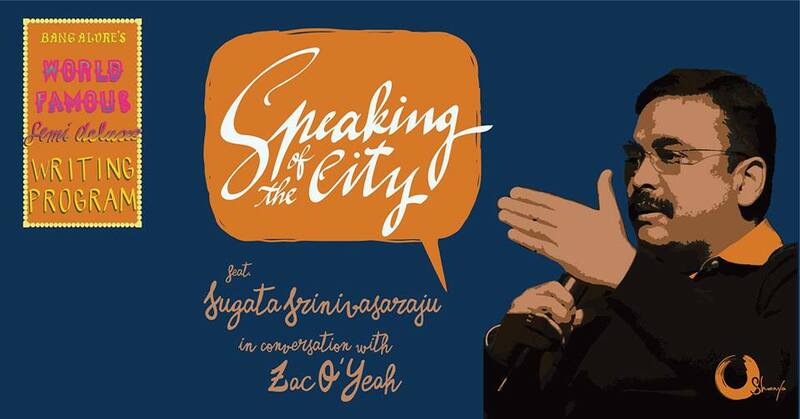 Sugata Srinivasaraju thrilled us in October with his thoughts on growing up in the city and how it has affected his views on writing – and his work as an editor, translator, and top journalist. 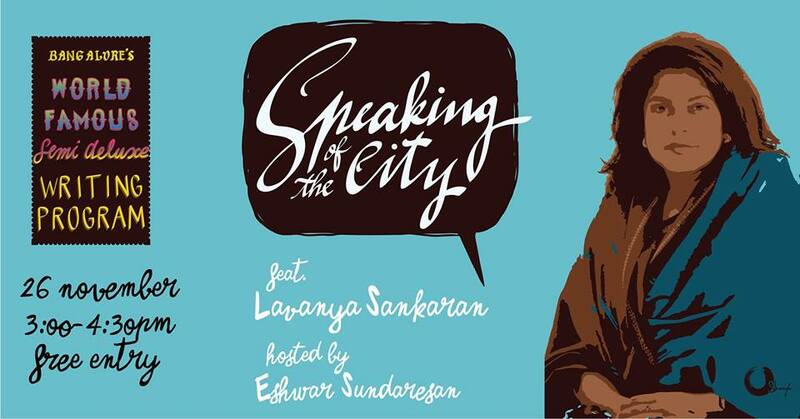 The fourth talk featured internationally bestselling and critically-acclaimed Lavanya Sankaran, who shared her thoughts with us in an exclusive event. 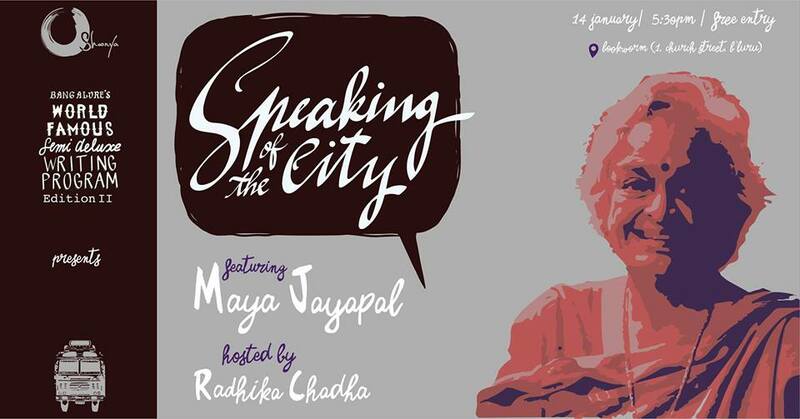 In the fifth, popular history author Maya Jayapal evoked the nostalgic confluences that make Bangalore the city it is. 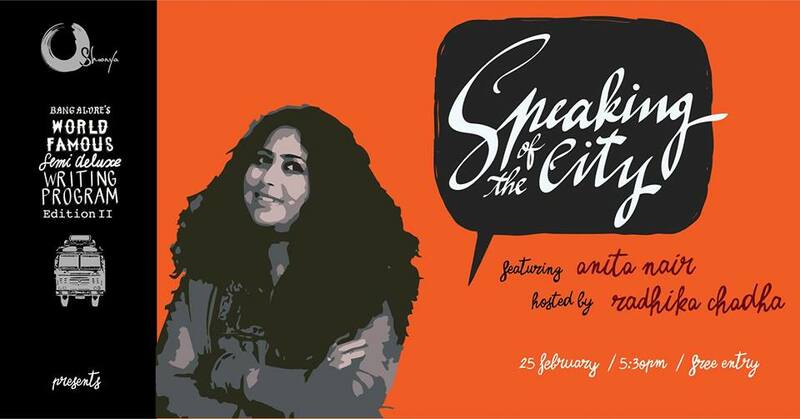 Our sixth talk, was with none other than Anita Nair – on the 25th of February. Next we had award-winning journalist Vikhar Ahmed Sayeed take us in and out of his journey with writing and the media. More recently we hosted Bangalore-based architect and urbanist Naresh Narasimhan, and last with acclaimed film lyricist and poet Jayant Kaikini. Ramachandra Guha is a historian and biographer based in Bangalore. He has taught at the universities of Yale and Stanford, held the Arné Naess Chair at the University of Oslo, and been the Indo-American Community Visiting Professor at the University of California at Berkeley. In the academic year 2011-2 he served as the Philippe Roman Professor of History and International Affairs at the London School of Economics. 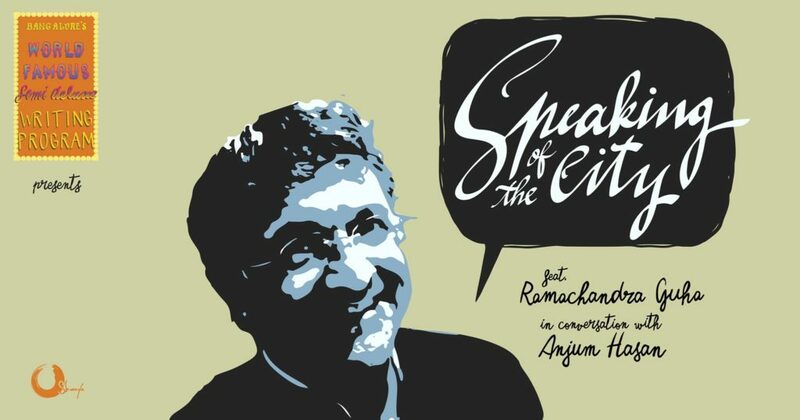 Ramachandra Guha’s awards include the Leopold-Hidy Prize of the American Society of Environmental History, the Daily Telegraph/Cricket Society prize, the Malcolm Adideshiah Award for excellence in social science research, the Ramnath Goenka Prize for excellence in journalism, the Sahitya Akademi Award, and the R. K. Narayan Prize. In 2009, he was awarded the Padma Bhushan, the Republic of India’s third highest civilian honour. In 2008, and again in 2013, Prospect magazine nominated Guha as one of the world’s most influential intellectuals. In 2014, he was awarded a honorary doctorate in the humanities by Yale University. In 2015 he was awarded the Fukuoka Prize. 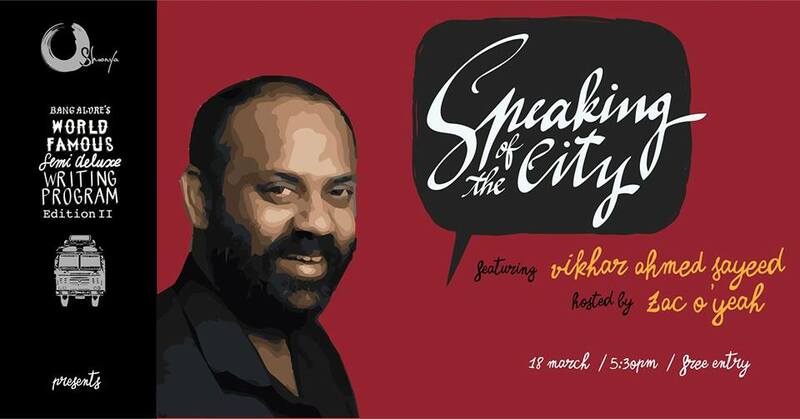 Vivek Shanbhag writes in Kannada and has emerged as one of the most interesting voices of the language. He has published five short story collections, three novels and two plays, and has edited two anthologies. Vivek’s stories have been translated into English and other Indian languages. 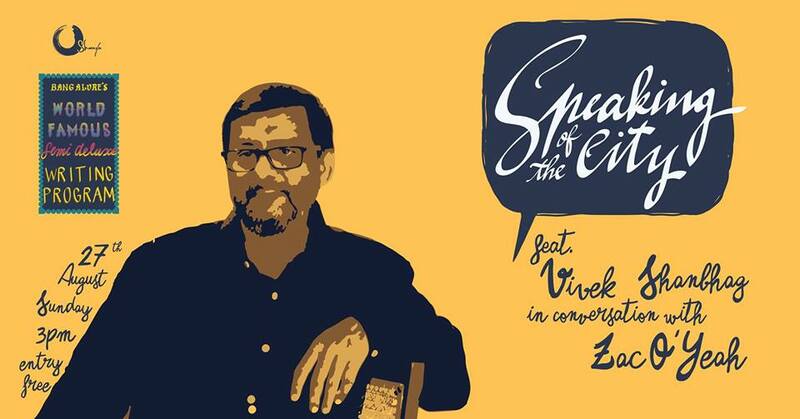 Vivek’s writing has appeared in Granta, Seminar, Indian Literature and Out of Print, and many of his stories have been adapted for the stage, and one of them ‘Nirvana’ has been made into a film. His critically acclaimed novel Ghachar Ghochar was published in 2015 in English translation and was hailed by critics in both the UK and the US. The bestselling book will soon appear in 14 other languages. He has also co-translated U R Ananthamurthy’s book Hindutva or Hind Swaraj into English. For seven years from 2005 to 2012, he published and edited the celebrated literary journal Desha Kaala, and subsequently he was a 2016 resident at the International Writing Program at the University of Iowa. An engineer by training, Vivek lives in Bangalore. Sugata is currently the Cofounder and Editorial Director of FirstPerson Media Ventures Pvt Ltd, a digital news and technology startup building two unique products thegoodstate.com and thestate.news. He is also the Vice Chairman of Sunohscapes Radio Foundation, a not-for-profit internet radio venture that creates and curates audio on current and contemporary topics. He was earlier Editorial Director of Asianet News Network Pvt Ltd, and Editor-in-Chief of the 50-year-old mainstream daily, Kannada Prabha. Prior to this, he was Editor-in-Chief of a leading Times Group newspaper, Vijaya Karnataka, with an average daily readership of four million. Before entering the regional media space in 2012, he was Senior Associate Editor of Outlook, India’s premier news magazine and News Editor of the Hindustan Times. Sugata started his career with Deccan Herald and was later a founding faculty member of the Indian Institute of Journalism and New Media. For excellence in print journalism, Sugata was awarded the British Chevening Scholarship in 2000. In 2008, he became an ILI Fellow at the Aspen Institute in Colorado, USA, and from 2011, he has been Aspen Global Leadership Network Fellow of the institute. Since 2015, he has also served as Adjunct Professor at the Department of Mass Communication and Journalism, Mangalore University. Nine US publishers competed in a three day auction for the rights to Lavanya Sankaran’s first two books: The Red Carpet (2005), a celebrated short-story collection, and her debut novel, The Hope Factory (2013). Lavanya’s writing has spent over two years on bestselling lists, including the number 1 spot on Amazon India. She has been translated into French, German, Italian, Russian, and Polish and is currently published in over 15 countries. Critically acclaimed by the Washington Post, Publisher’s Weekly and Kirkus, and compared to Charles Dickens by the British press, her writing has won several awards, including Barnes and Noble Discover New Writers, and Poets and Writers’ Best First Fiction award. Her opinion pieces and fiction appear in The New York Times, The Guardian, and The Atlantic, among others. Anita Nair is the author of the bestselling novels The Better Man, Ladies Coupe, Mistress, Lesson in Forgetting, Idris, Cut Like Wound and Chain of Custody. She has also published volumes of poetry and essays, and several books for children. Among other awards, she was given Central Sahitya Akademi Award for contribution to children’s literature in English. Her books have been translated into over thirty languages around the world. She is the founder of the creative-writing and mentorship programme Anita’s Attic. Vikhar Ahmed Sayeed has a postgraduate degree in history from the University of Oxford and is currently an award winning journalist with Frontline based in Bangalore. He covers topics ranging from religion, gender, caste and class. Vikhar has also reported extensively on communal issues in Karnataka. Vikhar Ahmed Sayeed is based in Bengaluru (Bangalore) and is a senior assistant editor with Frontline, a fortnightly news magazine published in India that celebrates long-form enterprise journalism. He writes regularly about class, caste, gender and religion and travels to rural areas to unearth powerful stories about ignored communities. Vikhar, who has a master’s degree in history, will spend the AJF doing research on Indian soldiers in Singapore during World War II. 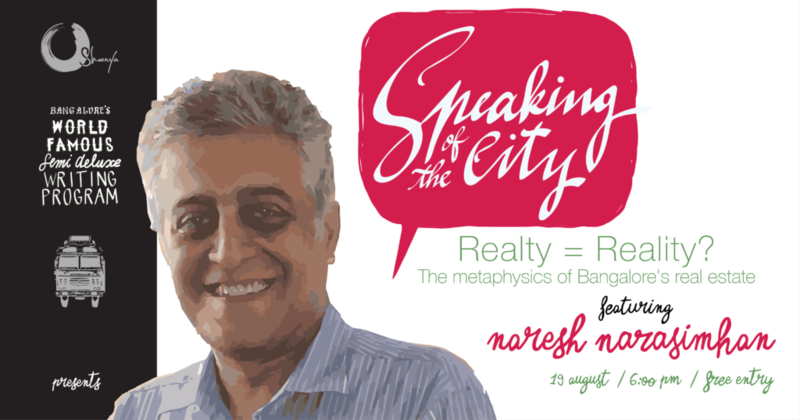 A talk on the intricacies of Bangalore’s real estate by Naresh Narasimhan. Who is the biggest land owner in Bangalore? Can you buy a home anywhere in the city you want to? How many slums does it have? Is it utopian to want a more equitable city? Architect and urbanist Naresh Narasimhan will address these and other questions in his talk. Naresh Narasimhan is Managing Partner and Principal Architect of Venkataramanan Associates which will soon complete 50 years of practice. His recent initiatives include Numa, a startup accelerator and coworking space in central Bangalore. Narasimhan is a co-founder of MOD Institute, an international collective of urban designers, and is a regular advisor to government bodies. The talk will be followed by an open Q&A with the speaker. Jayant Kaikini on his journey as a writer in and for Kannada cinema. 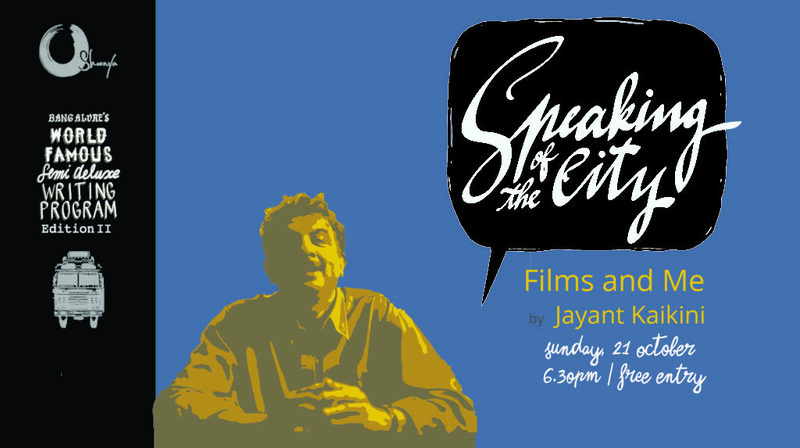 Jayant Kaikini is a leading poet, short story writer, columnist and playwright as well as a lyricist, script and dialogue writer for Kannada films. He has won several Karnataka Sahitya Akademi awards for his writings and the Filmfare Award for best lyrics in Kannada four times since 2008. No Presents Please – a collection of his selected stories – appeared in English translation this year. Mukund Padmanabhan on his journey from the small town to the city and how the latter came to dominate big media in India. Mukund Padmanabhan is Editor of The Hindu and has worked for the paper since 1997. In his career as a journalist, he has reported from Europe, Britain, Australia, Malaysia and Sri Lanka. He is an adjunct faculty of the Ateneo de Manila University in the Philippines, where he teaches law and advanced writing. 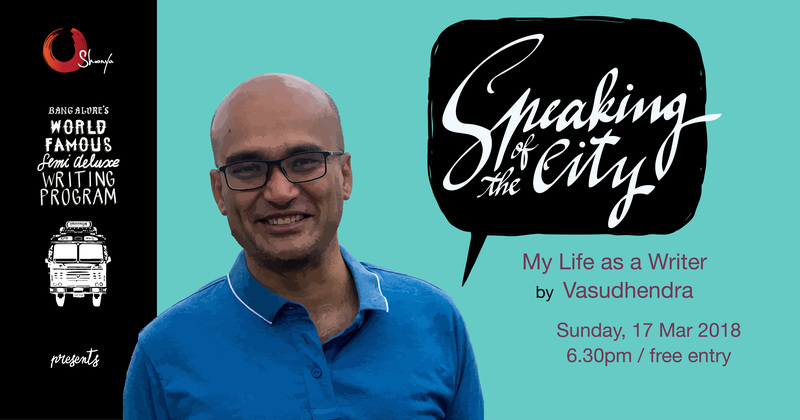 Vasudhendra on the writing and publishing of Mohanswamy, gay life in Bangalore, and the short story form. Vasudhendra is a Kannada author and former software professional who runs Chanda Pustaka, which publishes new writing in Kannada. He is the author of fifteen books, which have sold over one lakh copies. His collection of interlinked stories Mohanaswamy, chronicles the life of a young queer man and has been translated into English, Spanish, Telugu, and Malayalam. He is a winner of the Karnataka State Sahitya Academy Award. Keep a look out for the recordings of the talks to be shortly released on our Soundcloud page as well.